Tell the kids they're eating bat wings and they are sure to request them even when its not Halloween! Place wings in a plastic bag set in a shallow dish. In a small bowl stir together soy sauce, ginger, crushed red pepper, five spice powder and garlic. Pour over wings. Close bag and toss to coat. Chill in refrigerator several hours or overnight, turning bag occasionally. Remove wings from bag, reserving marinade. 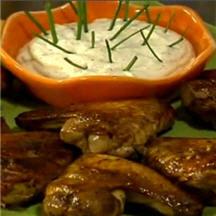 Place wings on a foil-lined 15x10x1-inch baking pan. Bake, uncovered, in a 450°F (230°C) oven for 10 minutes. Brush with reserved marinade (discard remaining marinade). Bake 15 to 20 minutes longer or until chicken is tender and no longer pink. Swamp Dip: In a small bowl stir together a 8-ounce container of dairy sour cream and 3 tablespoons coarse ground mustard. Garnish with fresh whole chives. Serve with bat wings. Recipe and photograph provided by Better Homes and Gardens - BHG.com a member of the Home and Family Network for the best of cooking, gardening, decorating and more. © 2003 Meredith Corporation. All Rights Reserved.